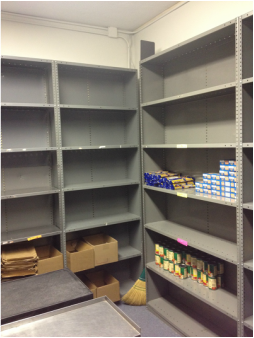 Empty Shelves waiting to be filled again. 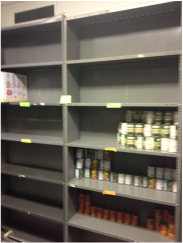 When the shelves are empty - it is time for the committee to go shopping - usually twice a month using donated funds to purchase foods and supplies from Second Harvest. 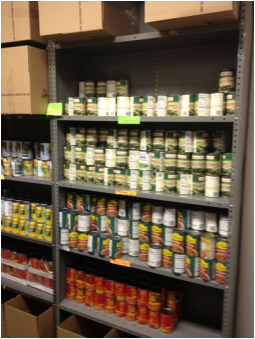 Or volunteers will stock the shelves with donated items which cannot be purchased at Second Harvest. Then the shelves are full. But if they stayed full, what would be the point? 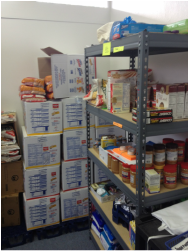 On monthly Distribution days boxes of food are prepared from all the items in the "pantry" and shared with those in our area, so the shelves go from being full to empty again. Empty yourself in service to others only to be filled again. "When I was hungry, you fed me."